For much of this century production and usage of explosives and propellants have been responsible for release to the environment of a variety of energetic organic nitro compounds. 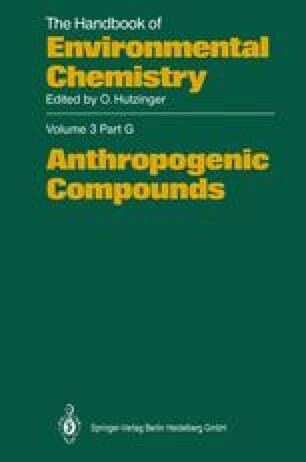 This chapter covers the compounds of greatest importance; their uses are indicated and methods for their manufacture or laboratory synthesis are summarized. Those physicochemical properties of greatest utility in environmental risk assessment are identified and listed. Analytical methods are described briefly, with references given to more detailed literature. For the more extensively studied compounds, the microbiological and chemical transformations known to take place in the laboratory and in the environment and the metabolic transformations observed in animals and man are discussed. Toxic manifestations in mammals, humans, fish and other aquatic organisms, as well as threshold levels for these effects, are summarized. While the process of utilization of available experimental data to develop criteria and standards to assure protection of human health and preservation of the biosphere is in its infancy and changing rapidly, a short summary of criteria currently accepted in the U.S. for certain of the munitions compounds is presented.